Photography, like any type of creative medium, has the power to tell stories, move you to action, or spark emotions in those who look upon it. Photography also has the unique ability to transport the observer to moments, places, and experiences that they might be thousands of miles from. We believe in the power of images to inspire. Once a week we will share an image that is particularly important to us and share the story behind it. Our hope is to connect you on a deeper level to places and people rather than just scroll past an endless supply or pictures. In the East of the Kathmandu Valley sits a small village called Chandani. 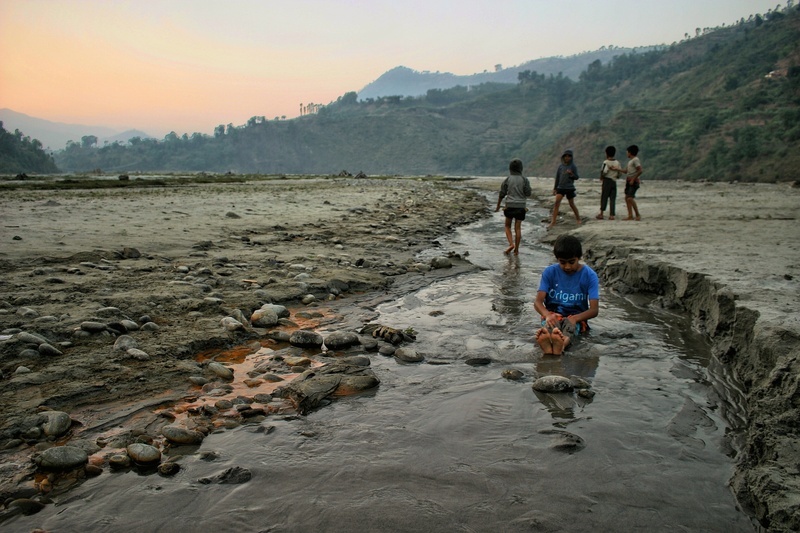 Overlooking the mighty Indrawati River, this beautiful landscape is home to an amazing community of people whose intimate relationship with the river extends to every aspect of life: drinking water, washing clothes, recreation, agriculture. The land is gorgeous and lush, filled with children’s laughter, good food, and wonderful people. We have been privileged to spend a little time there getting to know the people and learning from them about their way of life. Each visit back brings us something new, as well as the familiar feel of home. We have brought friends and others along with us to visit this place and the intimate setting and personal connection always leaves those who arrive nourished and changed. After a traditional breakfast of tea and porridge we walked down to the river with a group of kids from the village. It was a beautiful day outside and there was a light-hearted mood in the air. The sun was just coming up over the surrounding hills and a soft mist was rising from the cool water of the river. Tanner and I were lost in solitude, enjoying the beautiful scenery and watching the children run and play in the water. We noticed one kid who was apart from the rest. It was a boy named Ravi who was visiting the village with us. For a long time we watched him there, sitting in the river scooping the water up in his hands and watching it cascade down over his knees. Over and over again with a joy that seemed out of place for such a simple act he sat there and played. It was at this moment we saw a purity and innocence in him that time seems to steal from us. As we grow and carry the burdens of our modern world we lose that ability to find pure joy in the beauty that is all around us. It is something that only children know and sometimes they teach us their ways. Next Next post: Mongolia: A Toxic Warning Or A Beautiful Opportunity?